Pezzelli, Frank D., 65, of California and Rhode Island, passed away on Tuesday, September 1, 2015, at the Cedar Crest Nursing Centre in Cranston. 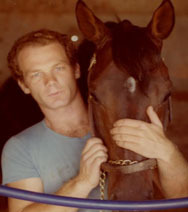 Born in Providence, he was the son of Lilwen (Thomas) and the late Frank Pezzelli. After graduating from Warwick Veterans High School, he entered the US Army and served in Vietnam. He had a gift for working with animals and spent his career as an equine dentist. He was an accomplished golfer and enjoyed painting in watercolors. He leaves two sisters, Vicki Tarro (Albert) of Warwick and Carol Wise (Daniel) of Midlothian, VA; two nieces, Alexandra Kanaczet (Matthew) and Catherine Wise, and a great-niece and great-nephew, Caroline and Jack Kanaczet. He is survived by many cherished family members and also leaves behind his beloved dog and constant companion Oreo. Burial will take place at RI Veterans Cemetery, Exeter, Saturday, September 19, 2015, at 10:00am.